Your Purrr-fect Birthday by R. A. Montgomery takes YOU on a birthday adventure through time and space to ancient Egypt, the signing of the Declaration of Independence, the beginning of time, and beyond. Your 6-8 year old reader will learn about hieroglyphics and Egyptian culture, face down guards who look like giant cats, and witness several very special types of birthday! 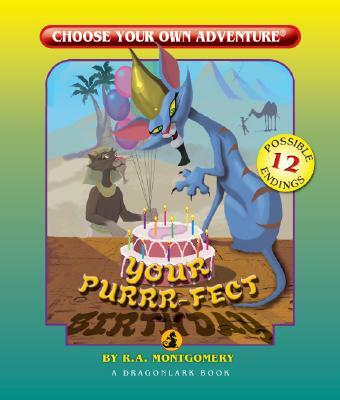 Choose Your Own Adventure Your Purrr-fect Birthday is an interactive adventure book in which YOU decide what happens next. Do you follow the directions your cat Festus has written in hieroglyphics? Or is it a trap? Do you try a sip of hairball tea? For readers that enjoyed other titles from the Choose Your Own Adventure Dragonlark series including: The Haunted House by R. A. Montgomery, Indian Trail by R. A. Montgomery, and Sand Castle by R. A. Montgomery.